This is a guest post from Aubrey House, a regular in my Thursday night gaming group. Aubrey is a long-time MMO player who's new to tabletop gaming, and I've asked her to weigh in on various games to provide a new player's perspective. Aubrey has played Shadows Over Camelot twice, first as the traitor, then a few months later as one of the heroes. Shadows Over Camelot is widely recognized as the first cooperative game to have a hidden traitor. It still compares favorably to the giants (Battlestar Galactica and Dead of Winter). I asked Aubrey to answer a few questions about her first time playing a co-op/hidden traitor game, both with and without the hidden traitor mechanic. Please enjoy a Q&A session with Aubrey! These first questions were asked immediately after Aubrey played her first game of SoC, in which she was the traitor and the victor. 1) What about Shadows drew you to the game? I was first introduced to the idea of Shadows Over Camelot by the YouTube show "Tabletop," though I didn't actually sit down and watch the episode. Shortly after seeing it in the playlist, I was invited to a game night where I got the chance to play it with some friends, which was great as I've always been very fond of Arthurian legends and the whole concept of knights, chivalry, and possibly being a traitor to my allies. 2) What were your impressions of the game? Did the mechanics/gameplay deliver on what the theme led you to expect? The first time I played the game, we played without a traitor and it felt very direct. It always felt very clear what we needed to do to win, and what would be one of the biggest risks if we didn't address the matter in a timely fashion. Overall, it seemed to me like it needed an additional mechanic (which we thought the traitor would fill nicely) to add that last little push it needed to make it a truly fun experience. 3) How was being the traitor? It was terrible. I went from being someone who could contribute to the team and sow some discord to sitting at Camelot and waiting to flip a card or add a siege engine to the line-up after everyone else did something meaningful. By being revealed as the traitor, I was essentially removed from the game, and could have been replaced by any random number generator (a dice, a coin flip, even a goldfish swimming to one side of a tank or the other) and the task would have been performed equally well. Even if I had been given the appropriate relic during gameplay (Lancelot's Armor) I would have been doing the same thing, except I would be given the choice of two black cards instead of one. It felt very much like the game was telling me I was no longer relevant, even though I ended up winning the game. 4) What do you wish you could have done during the game that you didn't get to do (either because you didn't have the chance, or because the game didn't allow for it)? Better direct interaction between the knights and the traitor would have made for a much better game. Having to wait through four other players to get the choice of picking one player, and randomly taking one of their cards means you have a very low chance of actually causing trouble. If I had the option to, for example, reinforce the invading saxons or aid the Black Knight in the tournament, I would have felt like I was doing more than I was when I was progressing evil and passing play back to the next player. 5) What advice would you have for a person playing as the traitor? Find another game to play while you wait for your turn to come back. Maybe take up knitting. 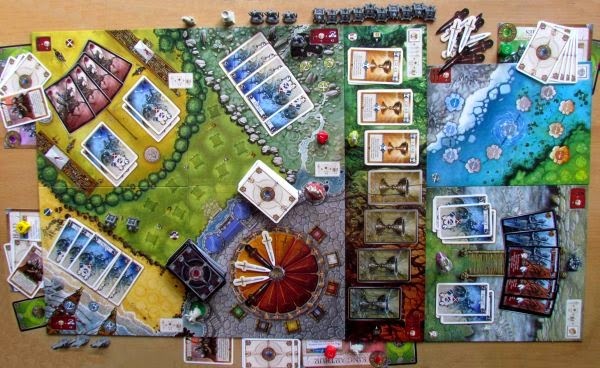 Being a traitor in this game is one of the worst experiences I've had in my (admittedly short) life as a board gamer. The following questions are from a few months later, after Aubrey played a second game of SoC as a hero in a game that had a traitor. 1) What's your impression after having played as a good guy? The game is a great introductory-level game for people who want to introduce friends to tabletop gaming outside of the standards of games like Risk or Monopoly. Replayability feels lower than many other games, but the core mechanics are fairly solid. Figuring out who the traitor was felt simpler than I prefer in social deduction games, though it's hard to say if that was from gameplay or if I was just overly familiar with the player who turned out to be the traitor. It was more fun, however, when there was some doubt as to whether or not the team was safe. 2) How was the game different without a traitor involved? Without the clear fact of a traitor existing, the game became more tense and more logical. Nobody wanted to invest too much on any one player for any given quest, or risk failed accusations against the potential threat of another knight. The game became much more social, which I think is paramount in tabletop gaming. Very few cooperative games can be truly fun without interaction, but Shadows found a good balance. Especially if the traitor is a good liar. 3) Do you think SoC is better with more or fewer players? 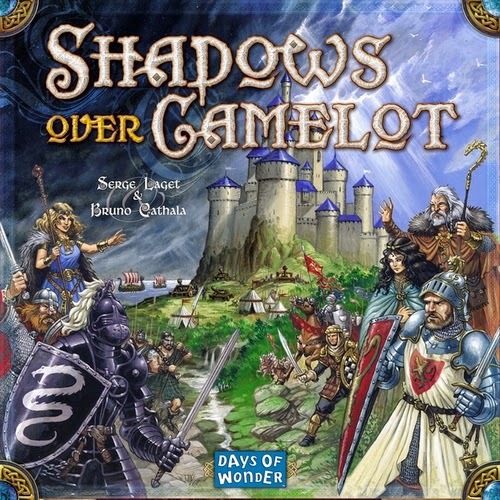 Shadows Over Camelot strikes me as the type of game that would be significantly more fun with more players, although I haven't had the opportunity to play the three-player variant. It also seems like, despite evil progressing faster in a game with many players, it would be more manageable for both traitor and loyalist alike. 4) How does SoC compare to other cooperative games you've played? 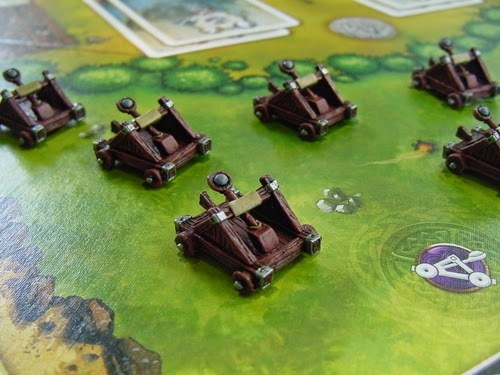 Shadows remains low on my list of co-op games that I have experience with, but it has improved with more attempts at securing the kingdom of Camelot. Very basic mechanics (One of three things happen, then you can do a thing, next player starts the cycle anew) means it's very welcoming to new or inexperienced gamers, but that rapidly becomes a stale descent into failure if things line up poorly. Which could be fantastic for a skilled deceiver. 5) What's your best strategy tip for a new player? Pay close attention to everyone's special abilities. King Arthur's trading could be the difference between a win and a loss. Sir Percival's "peek at the top of the deck" ability could be used to great effect by the traitor to rapidly advance the onslaught of siege engines. These eight special powers (one for each knight) provide the greatest variability to the game, and genuinely have a tangible effect on the difficulty of the game. If you've played Shadows Over Camelot and you've had a similar or different experience, answer the interview questions in the comments and let me know! I'd love to hear from you. JR Honeycutt is a full-time husband and game-player, and co-host of The Nerd Nighters. You can find him on Twitter at @JayAhre or at a Friendly Local Game Store in Dallas/Fort Worth, Texas. Some of his reviews are also published in Ravage Magazine or at Tabletop Gaming News.